This is the grey aunt of my Peanut Sloth and Lazy Sloth, the slowest creatures in the jungle. She is a perfect sleeping fellow or hilarious decoration to the nursery. Her light grey fur is very soft. Her body is 12,5 inches (32 cm) and has long arms and legs. She is 22 inches (55 cm) from head to toe. 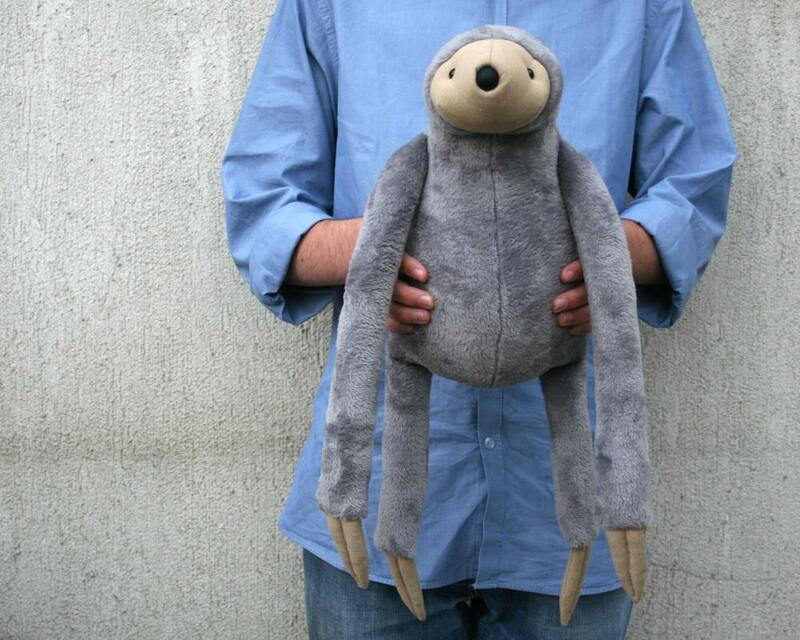 The last picture shows sloths in three different sizes. 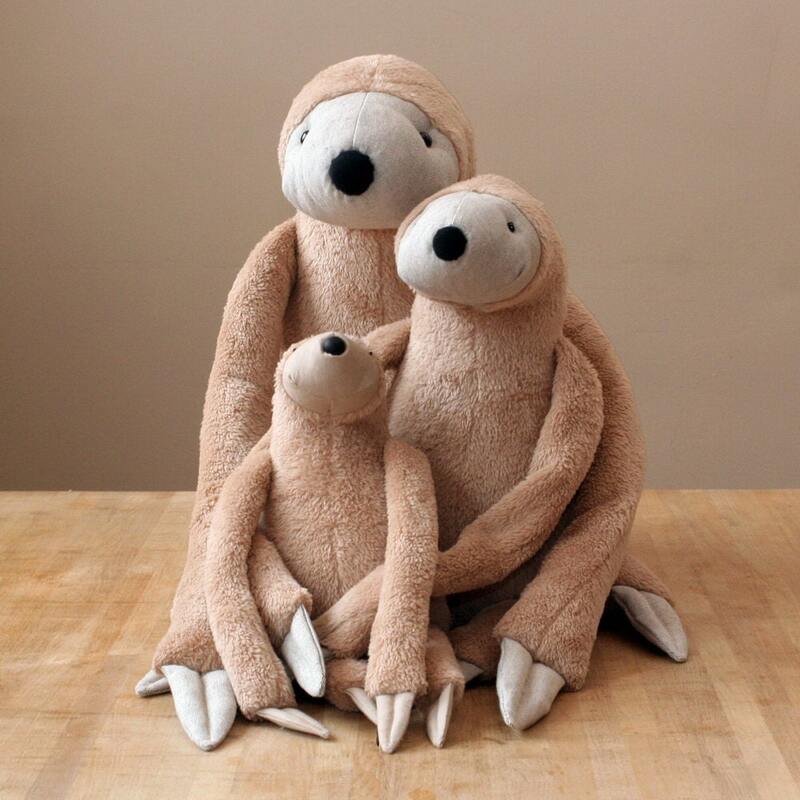 This size sits in the middle, the small one is the Peanut Sloth, which you can find in my shop, too. It's my own design. 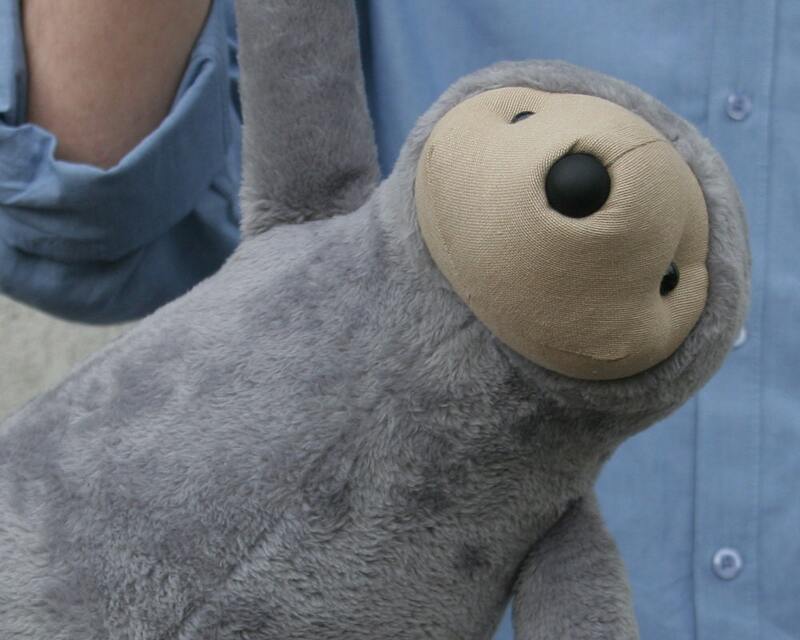 Made of very soft plush, stuffed with polyfill. The eyes and nose are buttons. If you would like to get a totally baby safe one then I can cover the buttons with black canvas patches - please contact me! It's funny toy for little children, or bigger ones. Now I can accept Etsy Direct Checkout as well, so you needn't a PayPal account to order! If you have any special requirements, please contact me before ordering. Once an item is paid for you have 24 hours to cancel the sale. NEW SHIPPING POLICY - Please convo me if you have any questions! I use two delivery providers - DHL or Hungarian Post. I use Hungarian Post (in partnership with local postal providers for the adressee's home countries) for most European parcels. These parcels are delivered in 2-4 working days. I always send the parcels tracked - online tracking service will be provided by the local provider for the addressee's home country. I can also deliver European parcels using DHL service but their price is higher. Please convo me if you prefer DHL service! I use DHL for most US and Canada parcels. These parcels are usually delivered in 3-5 days and always tracked. Please provide me the adressee's (mobile) phone number so DHL will send a message prior to the delivery! Some parcels are bigger than DHL's volume limits and sadly delivery cost would be very expensive for these ones. I dispatch these parcels using Hungarian Post's service and they will be delivered by USPS. DHL service is very expensive for the parcels to be sent to Australia, South or Middle America or Asia. 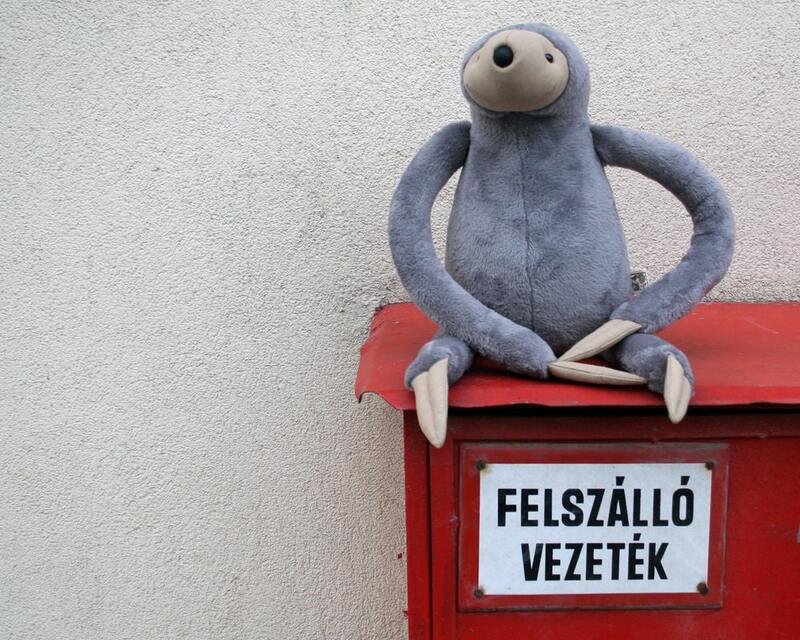 I can send parcels to these continents using Hungarian Post's service. If you would prefer DHL then please convo me and we can discuss the shipping cost options. READY TO SHIP ITEMS: I ship them in 5-8 business days of finished purchase. CUSTOM ORDER: please allow me 20-30 working days after received payment to make and ship your order. 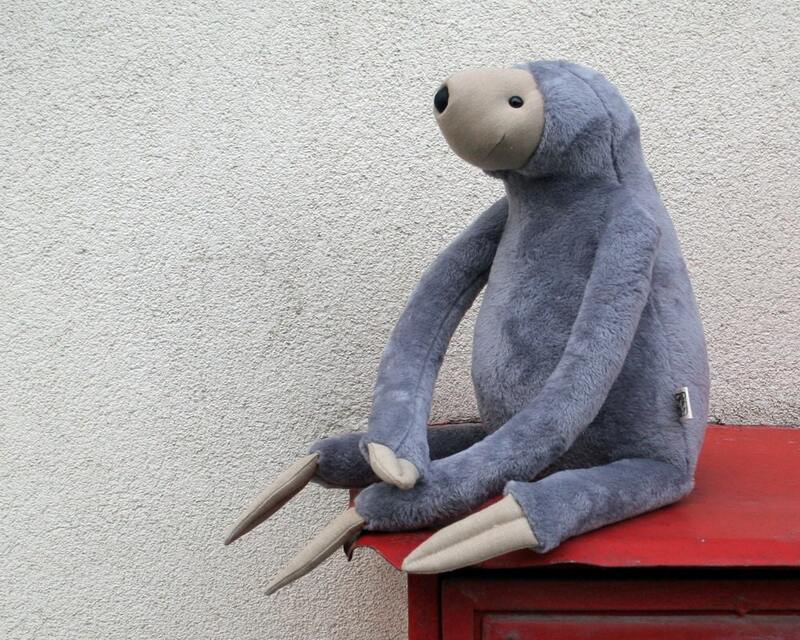 I always send a mail, when your order is dispatched. If you want them for a specific deadline, convo me, and I will let you know how soon I can make and ship. Please write me your shipping adress if it doesn't match with your address available on Etsy! It's important, otherwise I will ship to your Etsy address! Thank you! I do not take the responsibilities for customs fees. If you are unhappy with your order for any reason please contact me within 14 working days of receiving your package. I will do my best to resolve the problem quickly. If you would like to cancel your order after the receiption of the ordered item then you can cancel it within 14 days. In this case please send the clean and undamaged item back to me on your own expense, and I will refund your payment (incuding the original shipping fee) to you within 14 days. Custom orders are available. Contact me! •	Service providers. I engage certain trusted third parties to perform functions and provide services to my shop, such as delivery companies (Hungarian Post, DHL Hungary or DPD Hungaria). I will share your personal information with these third parties, but only to the extent necessary to perform these services. Cute, soft, well made, perfection! My niece loved it! With the arms and legs it was bigger than her! She instantly embraced the sloth and started dragging it around with her. Great toy!